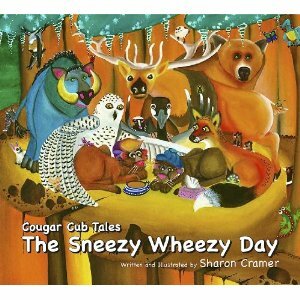 Cougar Cub Tales: The Sneezy Wheezy Day written and illustrated by Sharon Cramer is the tale of two sibling cougar cubs, one of which catches a cold. They visit various animals in search of cure. Eventually, it is rest and love from the sister cougar that gives the brother relief. Brother Cougar Cub is ill. With the help of sister, they seek the advice of their well intentioned forest friends. The Grizzly Old Bear tells him, The reason you re warm is you have too much hair. Best if you trim it as short as you dare. But, could it be that SISTER finally discovers the best remedy? The Sneezy Wheezy Day is a wonderful tale that will delight and challenge your child, but it is the paintings that will capture you and your young readers! Make sure to have your child search for the small, hidden creature on each page! Personally, I dislike the illustrations. The cougars look nothing like cougars, which really annoys me. The other forest animals are better drawn, but I also fear the message of this book is a bit off. I don’t know if the text is making fun of home remedies for colds and the flu through the animals silly suggestions or just trying to be entertaining. Perhaps the silly remedies would get a chuckle from children, but a sentence or two by the sister about how silly each suggestion is might drive the point home a little better. Would I buy this book? No. I don’t like the illustrations. They bothered me so much I think I couldn’t really listen to the story, and there is nothing green about it. Perhaps if the message would have included some information about hand washing, eating well, resting, herbs, etc. to include natural health, I might have been more inclined to like it. « The Best Ever Blueberry Spelt Coffee Cake Recipe! It is just my opinion. I am sure there are many that love the books! Weird, green child magazine loved it…maybe, besides the totally AWESOME art, they liked the idea of home remedies and family love, and that they printed it in the US of A!